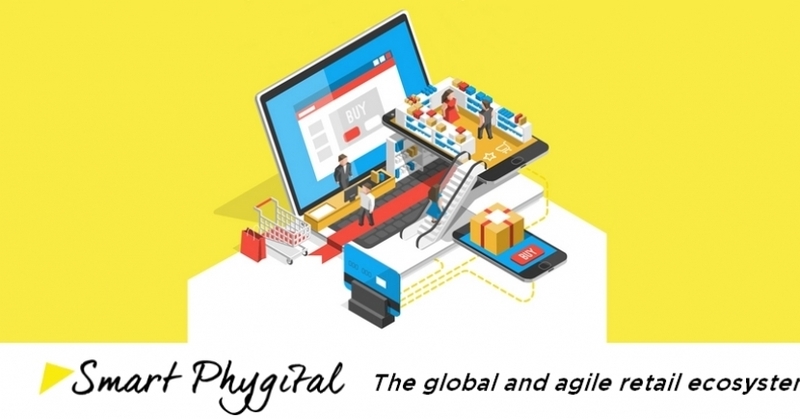 Welcome to the Smart Phygital era, the global and agile retail ecosystem! Smart Phygital: the global and agile retail ecosystem! Retail is continuously reinventing itself and is capable of thinking out of the box. This ability to learn from past experience recalls the mechanics of machine learning that enables artificial intelligence to learn in an automatic and systematic manner. Artificial intelligence – it seems to lie at the heart of all the trends that are stirring the retail industry. With the appearance of IoT, robotics, virtual or augmented reality, can AI be the link between all these emerging tools and innovations? Will it finally enable us to merge off- and on-line experiences rather than allowing them simply to co-exist? This intelligence demonstrated by the stakeholders of the retail sector naturally reflects the major mutations of society. In 2017 we spoke of Live Retail, authentic and human commerce. This trend goes even further with a real return to essentials – the search for meaning and value, even in the purchasing process. We speak of a purchase process rather than an act – the product has as much value as the positioning and the state of mind of the salesperson. Retailers have well understood this and today they propose shops that are designed “like at home”, they take the ecological footprint into account when optimising their supply chain, craftsmen have become the new stars of the marketplace, etc. And the shop among all that? Written off rather too early, shops are undergoing a particularly successful face-lift and are also finding a new lease on life by going back to the essentials: the sensory. Obviously, equipment is the cornerstone of this phenomenon; no successful shop experience can exist without fittings designed for the purpose. Shop layout is dead – long live scenography! To go even further, these sensations are enhanced by digital technology, an association that promotes a total and useful purchase experience that takes into account the needs (thanks to data) and offers true added value, notably through service. By digitalising, shops are rehumanising the purchase: CRM enables the personalisation of offers, sales staff equipped with tablets accompany the customer, the transaction becomes invisible, and click and collect reconciles off- and on-line retail. In short, 2018 will seal the union between the physical shop and the digital. Welcome to the Smart Phygital era! As China’s largest retailer, and a leader in global retail innovation, we set the standard for customer experience no matter where customers choose to shop, online or offline. We leverage technologies such as AI and big data to provide a personalized and convenient experience, enabling customers to buy whatever they want, whenever and wherever they want it - Boundaryless Retail. This year’s ‘Smart Phygital’ theme is about leveraging technology to provide a seamless connection between the physical, digital and virtual worlds to transform the customer experience - and that’s what we do every day.